Are you worried about how and at what price an item retails out at the POS and is replenished from sales data? Petrosoft offers seamless integration from the POS to back-office solutions with easy-to-use inventory forecasting reports to make replenishment a breeze. Smart retailers understand the benefits of Petrosoft’s back-office solution, C-Store Office, and its end-to-end retail automation solutions including POS, MTO self-service kiosk, fuel management and invoice processing solutions. Business can get complex. 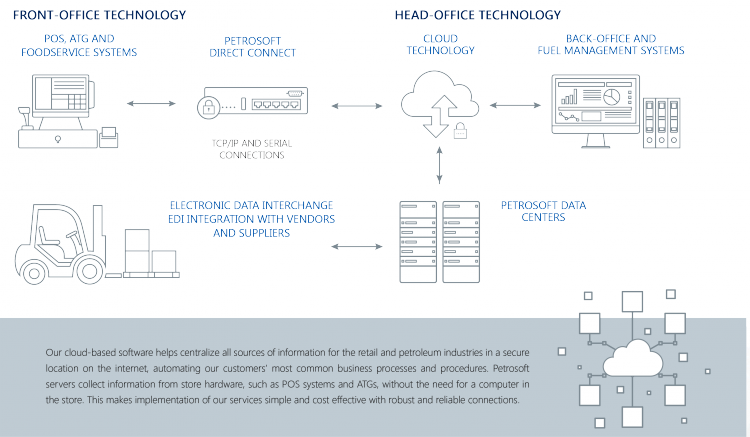 Secure end-to-end retail solutions from Petrosoft simplify retail operations. In today’s environment, convenience store operators no longer manage hundreds but thousands of items and each item has its own cost, margin and turn-over. Understanding which items contribute to your bottom line and maximize your profit requires an easy-to-use reporting platform with features that help you monitor and control sales margins from your desktop or any internet-connected device. Without these tools, volatile fuel prices, overworked staff and slow or inaccurate store data make it virtually impossible to have a highly profitable business. SmartPOS is the high-volume transaction point-of-sale (POS) solution with a responsive interface that reduces compliance risk and integrates with back-office and made-to-order kiosk systems, helping to keep shelves stocked and profits healthy. SmartPOS is the durable, fast and reliable all-in-one POS system designed to be an out-of-the-box and easy-to-use solution for retailers. Qwickserve is an innovative made-to-order software and hardware solution for quick service restaurants (QSR) and other foodservice retailers. It enables QSR operators to customized their menus and track orders based on recipe costs. Qwickserve also enables QSR customers to enter and customize their menu item orders through a self-service kiosk, empowering customers and reducing data entry time and errors. DirectConnect is the reliable, fast and secure way for retailers to connect their point-of-sale (POS) and Automatic Tank Gauging (ATG) systems to their back-office systems (BOS). This efficient solution enables near real-time data transfers and reduces ATG and POS data transfer vulnerabilities as well as transfer time by 37%, transferring the data from a POS system in under 40 seconds. C-Store Office is the trusted back-office software solution for single and multi-store retailers. It provides a virtual workspace for recording, processing, tracking and forecasting inventory and sales. It provides the infrastructure, workflow and reporting needed to maximize margins and turns. This solution can save reconciliation and travel time while also decreasing the retailer’s IT costs. Stay connected to your business from any internet-connected device with C-Store Office. Fuel-Central is a cloud-based fuel distribution management software solution with customer account management, accounts receivables management, fuel inventory forecasting and management as well as fuel driver and fleet scheduling management features. It is designed to enable fuel wholesalers, jobbers, or distributors to decrease time-consuming manual processes, eliminate haul backs as well as optimize driver and fleet scheduling for optimum productivity and returns.